With just over two weeks to go until the Jubilee weekend, the Official Souvenir Programme celebrating The Diamond Jubilee, containing messages from Her Majesty The Queen and His Royal Highness The Prince of Wales, is on sale. The souvenir publication, which was produced with the cooperation of The Royal Household, provides the reader with an insight into Her Majestyâs life and reign, and recalls the splendour of previous Royal Jubilees. In her Jubilee souvenir message, Her Majesty The Queen writes: "This memorable year will serve to remind us of the importance of family and friendship, examples of which my family and I have been fortunate to see in many forms during our Jubilee travels throughout the United Kingdom and the wider Commonwealth. It will also be a time to give thanks for the many achievements of the last six decades and to look to the future as we join together in our celebrations." In his message for the publication, HRH The Prince of Wales highlights The Queen's "extraordinary contribution to British public life", and says: "Her Majesty's life and work have given a powerful expression to those cherished qualities of selflessness and duty which, in so many ways, have helped to transcend the immense changes in the last six decades." 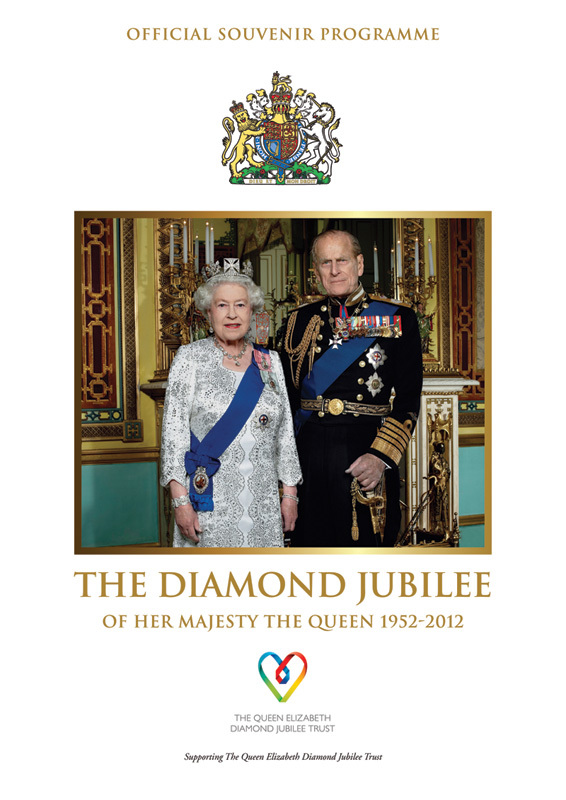 A portion of the proceeds from the souvenir's sales will be donated to The Queen Elizabeth Diamond Jubilee Trust (QEDJT). Chaired by former British Prime Minister Sir John Major, The QEDJT was set up to honour The Queen and celebrate her lifetime of service to the Commonwealth. Funds raised by the Trust are invested in projects that make a real and lasting difference to people's lives and create a lasting tribute to Her Majesty. The souvenir publication will be available across the UK in leading retailers including Tesco, Sainsbury's, WH Smith, Waitrose and Asda, as well as The Royal Collection shops. Over the Jubilee weekend, the souvenir will also be available in Hyde and St James's Parks. The official souvenir will also be on sale in Australia, New Zealand, Canada, France, USA, Italy, Belgium, Norway, Cyprus, Malta, Hong Kong, Singapore and South Africa. "It's been a privilege to produce this, the official Diamond Jubilee souvenir - a tribute to Her Majesty and the 60 memorable years we are now celebrating. We hope we have faithfully represented her as she is - diligent, dignified, and above all, dedicated." "The Royal Parks is very proud to be part of the Diamond Jubilee weekend and to be hosting celebratory events, including parts of the ceremonial procession along The Mall, within our beautiful parks. We are very excited that the official souvenir publication, a wonderful accompaniment to the events and proceedings, will be sold within our parks." Established in 1996 Publications UK is a customer publishing and events company that specialises in creating and delivering high-quality publications for UK and international government bodies, trade associations and blue-chip companies. Previous work includes a publication to celebrate the 80th birthday of The Queen and a tribute to The Prince of Wales, on his 60th birthday. A highly successful publication to mark the wedding of the Duke and Duchess of Cambridge was also sold throughout the Royal Parks during the wedding last year. The company is also the media partner for the Guards Polo Club, of which the Duke of Edinburgh is the founder and president. For further information regarding Publications UK the media are asked to contact 020 8238 5023. Publications UK worked with former Royal Correspondent Tom Corby MVO to produce the publication. Tom was the sixth former Court (Royal) Correspondent of the Press Association. In his role he had access to Buckingham Palace and other Royal residences and acquired an unique insight into the Royal Family and the institutions of Monarchy. He has interviewed several members of the Royal Family and travelled the world with them. He was also appointed a Member of the Royal Victorian Order by Queen Elizabeth II for personal services in 1993. The Royal Parks is proud to play a key role in the Diamond Jubilee ceremonial proceedings hosting a number of celebratory events along The Mall, at the Queen Victoria Memorial in front of Buckingham Palace and in Richmond, St James's, Green and Hyde Parks, four of London's eight Royal Parks. Thousands of UK residents and international visitors are expected to visit these areas during the royal celebrations. The eight Royal Parks are: Bushy Park, The Green Park, Greenwich Park, Hyde Park, Kensington Gardens, The Regent's Park and Primrose Hill, Richmond Park and St James's Park. The Royal Parks also manages Victoria Tower Gardens, Brompton Cemetery, Grosvenor Square Gardens and the gardens of 10, 11 and 12 Downing Street. The Trustees of The Queen Elizabeth Diamond Jubilee Trust are The Rt Hon Sir John Major KG CH (Chairman), Kamalesh Sharma Commonwealth Secretary-General, The RT and Revd and Rt Hon Richard Chartres KCVO, the Rt Hon Sir Christopher Geidt KCVO OBE, Professor Sir Mervyn King GBE FBA and the Rt Hon The Lord Robertson of Port Ellen KT GCMG HON FRSE. The Queen Elizabeth Diamond Jubilee Trust is a registered charity in England and Wales (no 1145640).